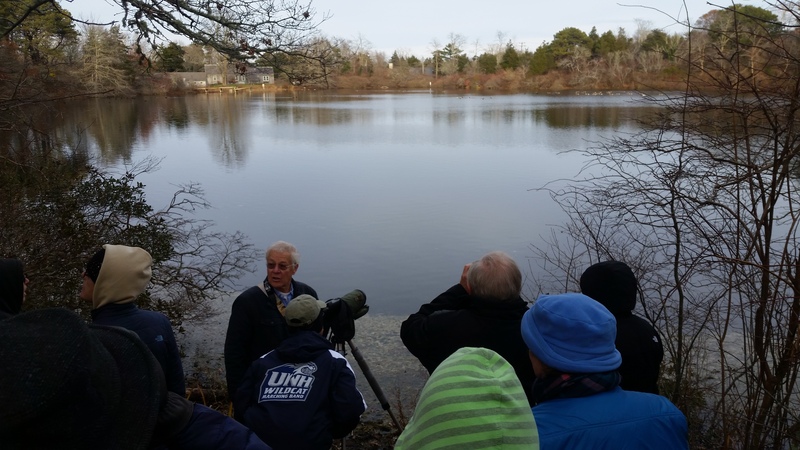 On Sunday, December 4th, OCT sponsored a guided walk through the Ice House Pond and Reuben’s Pond Conservation Area. This beautiful 25 acre parcel was donated to OCT by the Moore, Wilbur and Hopkins families. Our guide was Bob Prescott, bird expert and Director of the Mass Audubon’s Wellfleet Bay Wildlife Sanctuary. The walk began at the trail entrance on Tonset Road, and our group of 20 proceeded to Ice House Pond. There we saw a variety of dabbling ducks including the mallard, American wigeon and American black duck. Also represented was a small flock of Canada geese. Interspersed among this mix was a male and female pair of hooded merganser. These diving ducks have a distinctive crest, with the male sporting a gorgeous black and white pattern and the female an elegant cinnamon colored crest. Next we walked over to Reuben’s Pond. When we got to the hill overlooking the pond, we heard a loud commotion coming from a group of crows. Then we saw the crows chasing a pair of great horned owls. Bob explained that the crows try to prevent the owls from nesting since they are such fierce predators. One of the owls eventually settled in a tree near the trail. We all got a clear view of it through Bob’s scope. It was magnificent and a real thrill for all of us on the hike. We send our sincere thanks to Bob Prescott for leading us, and we hope to see you on one of our future walks!